The Strokes are back, and yes loyal Strokes fans, there is still a lot to complain about, but more importantly The Strokes offer their best album since 2001’s legendary Is This It? After a five-year hiatus that brought us a slew of solo albums from Strokes members that were good, but lets face it, not The Strokes, we finally have Angles. Angles starts with a bang with the guitar heavy “Machu Picchu.” Sounding bizarrely similar to “Land Down Under” by Australian rockers Men at Work, The Strokes immediately cue the listener in on their disregard for expectations. Additionally, Casablancas makes light of their five-year hiatus by singing: “Putting your patience to the test.” Perhaps it’s not your cup of tea, or for the sake of mentioning Men at Work one more time, your flavor of “vegemite sandwich,” but nonetheless “Machu Picchu” tells fans and critics that they are going to do what they want with their album. The album continues with the radio-friendly “Under Cover of Darkness” which opens up with guitarists Albert Hammond Jr. and Nick Valenzi making their guitars squeal in perfect syncopation. Yet “Under Cover of Darkness” certainly lacks the edge that has helped define The Strokes in the past. While Casablancas croons “I’ll wait for you, will you wait for me too?” it can’t help but make one miss Casablancas when he was singing “you talk way too much.” It may take a listen or two to realize, but “Undercover of Darkness” sounds eerily close to a love song, yes, let that resonate for a second or two, a love song. Last I checked, what fans want from The Strokes is the fashionable culmination of not giving a s*** and playing gritty pessimistic music that paradoxically comes out as positive and happy. Lets leave the dorky wonderland lyrics to John Mayer. Fortunately, the album continues with force. “Two Kinds of Happiness” finds The Strokes back in the eighties, but lets all face it, the eighties totally rocked! “Two Kinds of Happiness” also offers a chorus of sweltering guitar riffs that will knock you right out of your Members Only jacket. 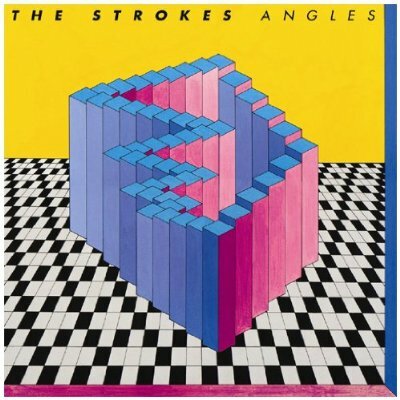 Angles climaxes with “Taken For a Fool” which reminds us why we love The Strokes so much in the first place; gritty guitar riffs and a chorus of simplicity so pure it would make Mark Rothko proud. Utilizing lyrics like, “I know, everyone goes any damn place they choose” and “we’re so lucky because we never grew up,” Casablancas articulates frustration and contentment in a way only he can.